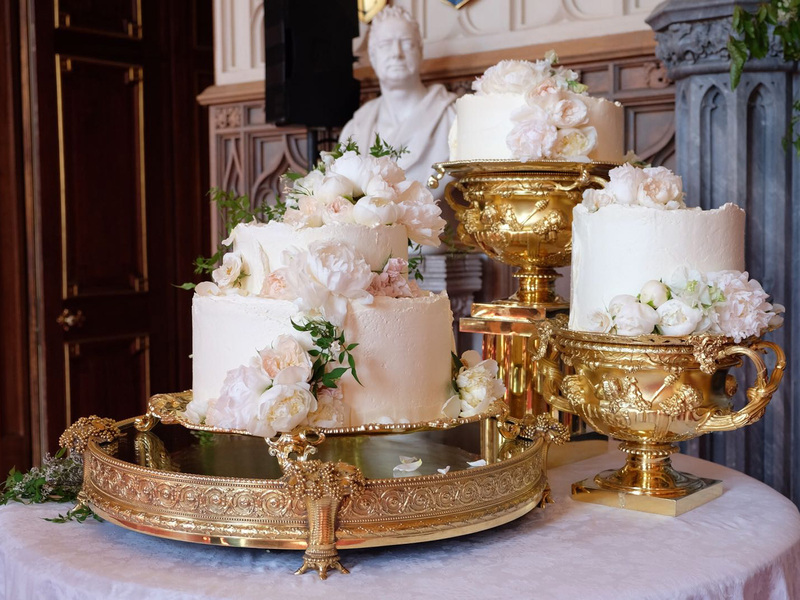 The Duke and the Duchess of Sussex put significant thought and meticulous detail into each component of their wedding, from the décor to the musical selections, having the nuptials reflect their own personal love story. 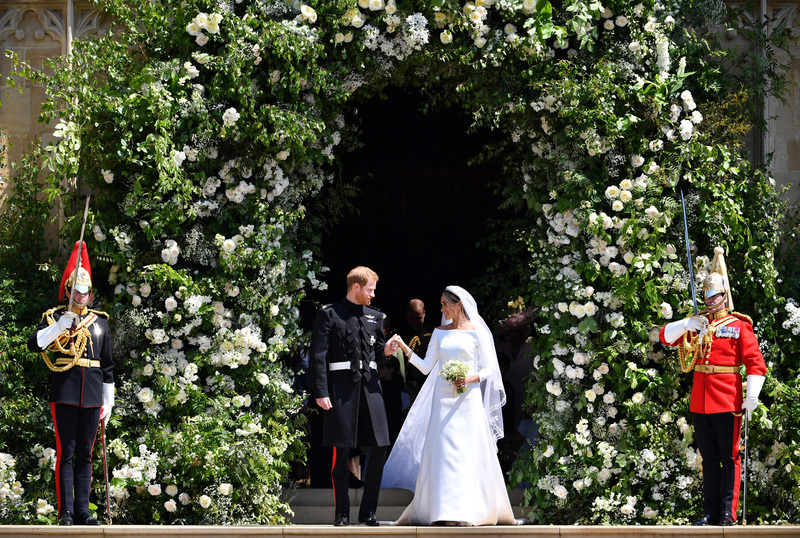 Here, the editors of The Knot source 10 trends from Harry and Meghan’s wedding that you will see everywhere in the year ahead—from an abundance of greenery to more sentimental bouquets. In a rather symbolic moment, Markle walked herself down the aisle halfway inside St. George’s Chapel, leaving behind her former life—her social media accounts, her acting career and more—to be ushered into the royal family’s arms, or in this case, with Prince Charles by her side. The sweet gesture, after a rather tumultuous week leading up to the wedding day itself, moved viewers to tears. Markle’s simple bouquet had an abundance of sentimental value. The floral cocktail consisted of sweet peas, lily of the valley, jasmine, astrantia, astilbe and sprigs of myrtle, a royal tradition representative of luck in love. Perhaps the most sentimental portion of the bridal bouquet, crafted by London florist Philippa Craddock, was the addition of forget-me-nots—a favorite of the late Princess Diana, who was honored in numerous ways throughout the wedding day. Whether it’s dreamy scented jasmine that the mother of the bride recalls from her youth or tulip buds planted by a late grandparent, there’s a significant story to tell through the bridal bouquet. 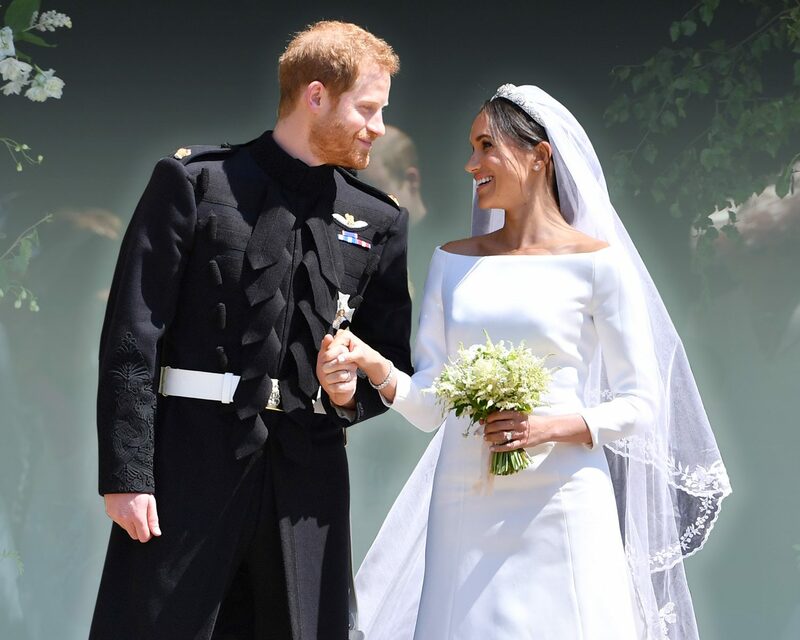 Markle discovered her photographer via Instagram, a method couples are increasingly using to source potential vendors of their own. According to The Knot 2017 Real Weddings Study, 54 percent of couples are researching wedding vendors on their smartphones, up from 31 percent in 2014. And that’s not the most astounding statistic: 92 percent of couples are using their phones for wedding planning activities. Tasked with designing Harry and Meghan’s ceremony space is no simple feat, yet Philippa Craddock managed to bring freshness to the forefront, particularly with the magnificent installations framing the entrance of St. George’s Chapel and its interior chambers. Craddock, fittingly dubbed the reigning queen of London-based florists, revealed that she used foliage for the base (stocks, nigela, astilbe, asparagus fern) topped by white garden roses and peonies—all sourced from Windsor Great Park. “Greenery just feels fresh and vibrant,” says Cooper. “And it’s also easy on the budget, which is always a good thing.” Plus, couples can exercise flexibility by adding flowers to an already lush base. Effortless-yet-borderline editorial is how we’d describe the royal couple’s wedding day portraits. 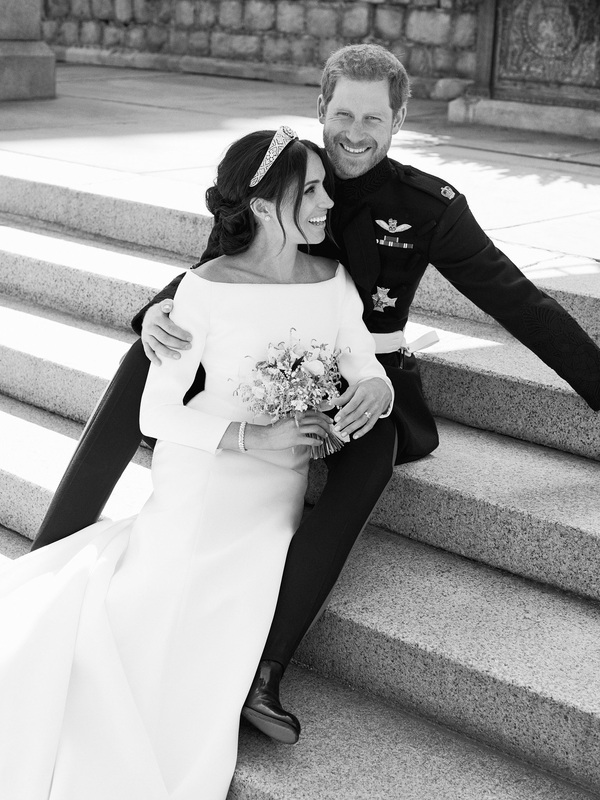 While Harry and Meghan went with a high fashion photographer, the candid image of the newlyweds laughing on the castle steps truly exudes the loving warmth that’s come to define their relationship. 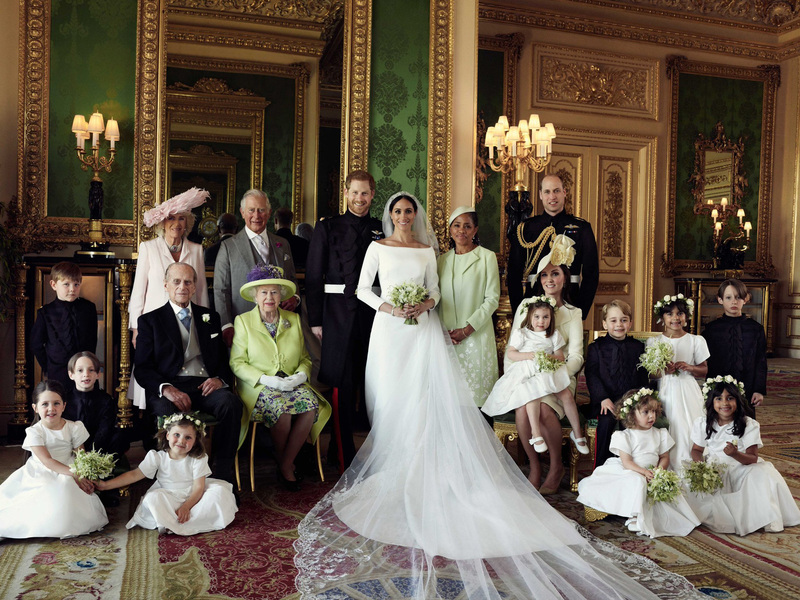 “It was just one of those magical moments when you’re a photographer and everything falls into place,” photographer Alexi Lubomirski subsequently said. “They were just laughing because they were joking about how they were exhausted and finally, it was over.” More couples will likely seek this quality of imagery as they look to combine authentic moments into their wedding photos–with an aspirational twist. 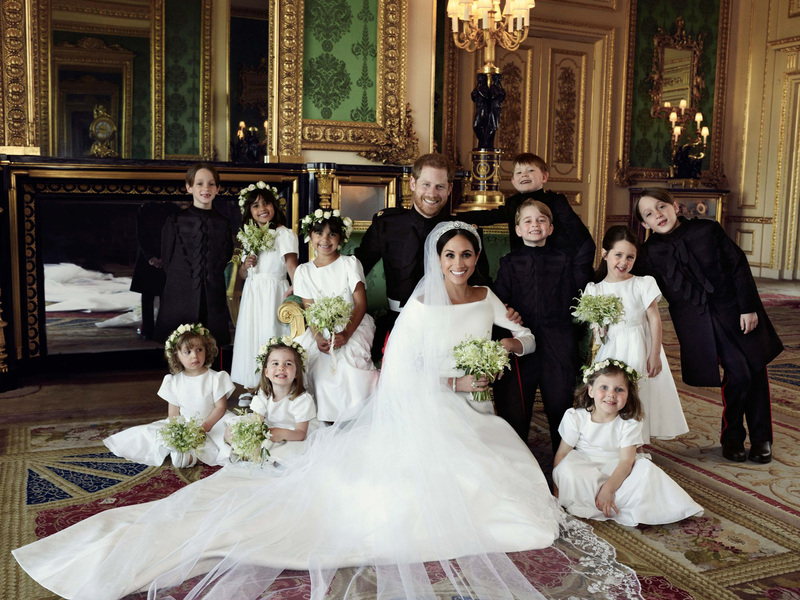 Markle maintained royal tradition by having an entire junior bridal party, though the bride—at age 36—still honored her inner circle in a lovely way. The former actress specifically asked all three children of her best friend, stylist Jessica Mulroney, to be in the bridal party. 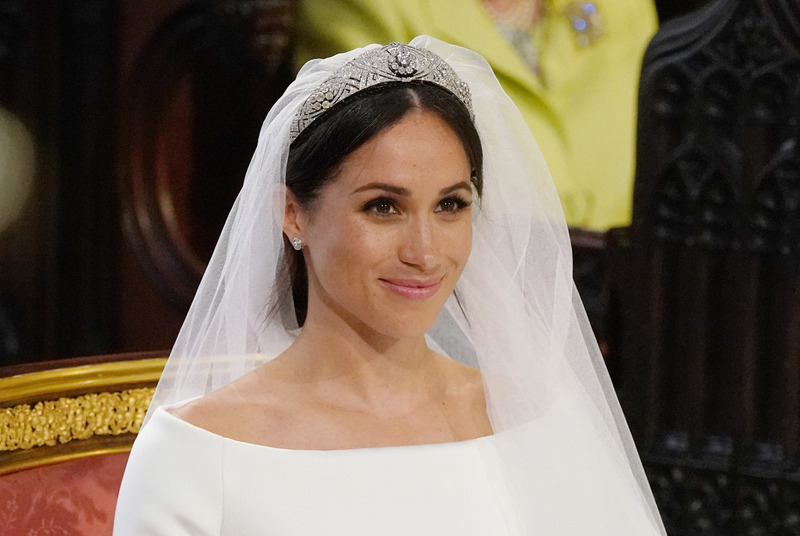 Markle opted for a dewy, barely-there makeup look on her wedding day, gloriously stepping out as… herself. 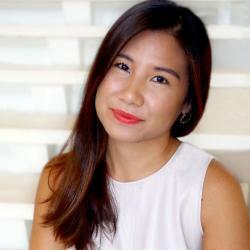 The bride’s makeup artist revealed that the former Suits star wanted the dress to be the focus as opposed to her face, so she went for an accessible bridal beauty look. Markle stepped out with a subtle smoky eye, tinted moisturizer that showcased her freckles, and a pop of pink lip color for a flawless and timeless finish. The star’s facialist Nichola Joss previously revealed that Markle has always considered facials to be essential to her beauty routine. The Duchess also cautiously follows an at-home routine comprised of natural beauty products for maintenance in-between facial sessions. Finally, Markle has previously expressed her love of coconut oil, which has become a staple in her beauty routine over the years. 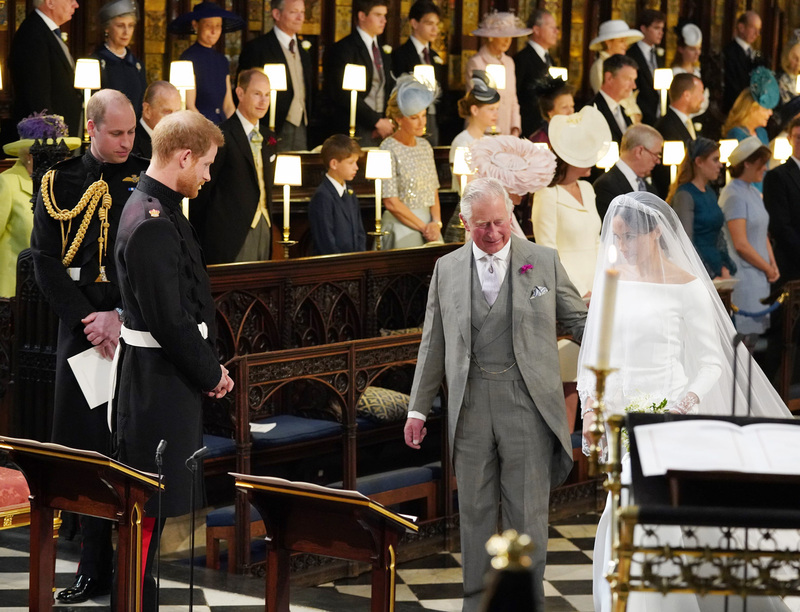 The Duke and the Duchess of Sussex put great thought into their musical choices by including an award-winning cellist and a London-based gospel choir to deliver melodious sounds for their guests. For example, the Kingdom Choir’s rendition of Ben E. King’s “Stand By Me” moved the guests and viewers worldwide. Prince Harry and Meghan Markle certainly took a page out of The Knot’s 2018 trend report, where we reported how inventive, mouthwatering flavors are on the upswing for food-adoring couples. The royal couple broke tradition by opting for a lemon elderflower confection that still honored the family: the elderflower syrup came from the Queen’s estate in Sandringham, which again raises the point of the couple considering sustainability as they planned their nuptials. 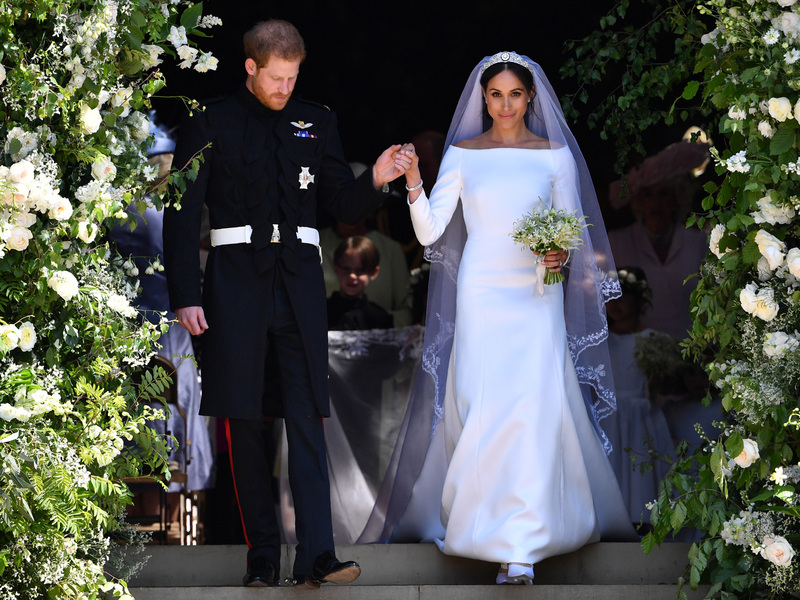 Markle stepped out in an understated-but-lovely custom gown by Givenchy artistic director Claire Waight Keller for her wedding day, a choice that will impact both brides and designers in years to come. “Given that Kate Middleton’s ballgown with lace sleeves basically reintroduced sleeves to bridal fashion after years of strapless silhouettes reigning supreme, I expect to see a lot of unembellished dresses with clean lines, boatneck and mock turtle necklines next Bridal Fashion Week due to Meghan Markle’s influence,” Brown says. 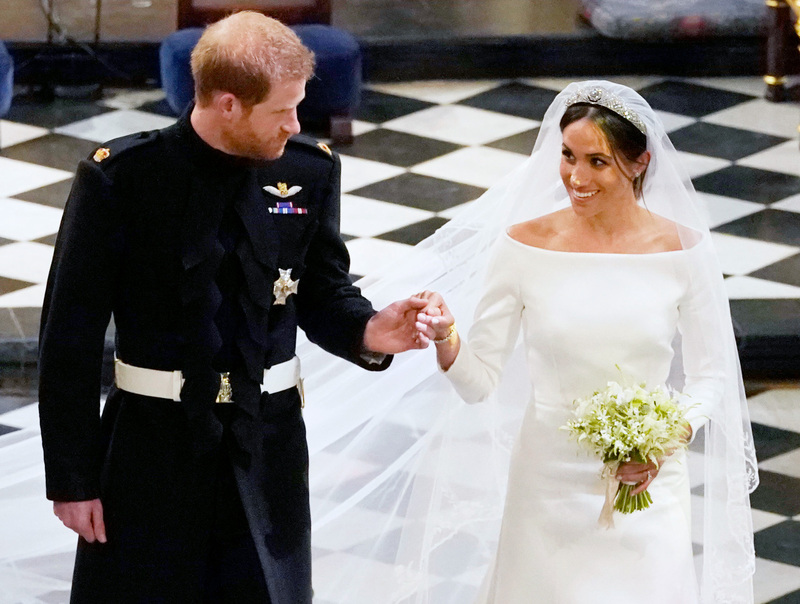 While her dress was more low-key than expected, Markle’s cathedral-length veil was a truly regal option as it cascaded down the steps of St. George’s Chapel. According to the palace, the former actress had all 53 countries in the Commonwealth represented and embroidered into her veil. Expect to see an uptick in simple dress silhouettes paired with standout, sentimental accessories and statement pieces. Looking for your wedding day vision? Start with The Knot’s Style Quiz, here. Be the first to comment on "10 Royal Wedding Trends You’ll See Everywhere in 2018: Fresh Greenery, Alternative Walks Down the Aisle and More"